Discussion how can i get vcf file without repeat snps? how can i get vcf file without repeat snps? i just call snp with my several samples` RNA-seq data . then i get several vcf files , so i just use the function "MergeVcfs" to combine them into a big vcf files. and i use the "CollectVariantCallingMetrics" to evaluate it . then i find that this big vcf file contain all the snps in my samples , even those snps whose share the same sites. so what i wonder is can i get a vcf file that all snps get the unique site. i know it may be a complicated question , because i think this kind of big vcf file contain the snps whose genotypes is different in a way. so if i want to get a one-site-one-snp vcf file , the information about genotype may get wrong. or my question is simplified in this way: i just want delete the repeat snps to get net number about my snps. maybe my description is not so clear , but i am really trying my best to describe my question as best as i can. Hi @Zea1nfO, in GATK3 there is a tool called CombineVariants that does what you want. In GATK4 we don't yet have that exact functionality. Regarding methods A and B as you define them above, your understanding is correct; we use A for RNAseq and B for DNAseq germline variants. Some people also use B for RNAseq but we have never evaluated or validated that usage so it is unsupported. The ALT alleles of multi-allelic SNPs would be A,G (not A/G). This is defined in the VCF format specification (see the Dictionary section of our documentation). Oh right, that tool can be a little confusing as it's rather complex. This requires you to specify whether the calls come from different samples or from the same sample. If they're from different samples, you choose -genotypeMergeOptions UNIQUIFY and that will create separate genotype columns for each sample. 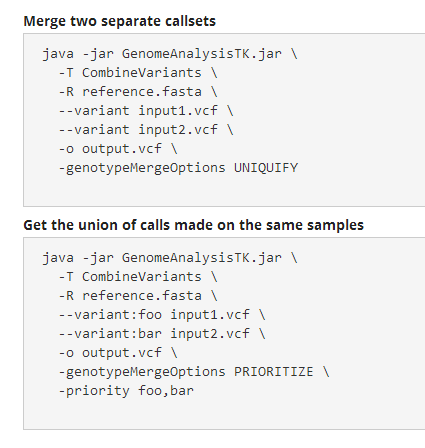 If they're from the same sample, you choose -genotypeMergeOptions PRIORITIZE and you specify which callset's information to use for overlapping calls. It sounds like in your case you need the UNIQUIFY mode. Hi, can you show a few lines of what you have right now and of what you would like to get instead? just like the picture: i got A.vcf , B.vcf , C.vcf. and the big vcf is what i want . these days i was always working on it , i think maybe i can use VariantToTable to convert it into a table-delimited file . Then i use R studio to get what i want . Maybe it is a complicated question. method B: HaplotypeCaller -ERC GVCF mode + GenotypeGVCF call snp and indel . maybe A for RNA-seq , B for DNA-seq ? The second question is how does the multi-allelic snp show in the vcf ? maybe just like this following ? by the way , my data is diploid sample`s data. How can i get multi-allelic SNPs from my big vcf ? I think i can use CombineVariants to combine my several diploid samples` vcf , and then use SelectVariants with -selectType SNP -selectType MNP -restrictAllelesTo MULTIALLELIC to get a vcf which only contain multi-allelic SNPs. i know you are on vacation now , so have nice days. but i still want to you a question , maybe you can answer me when you`re back on work. when i try to use CombineVariants in GATK3 to get my big vcf i talk about above , i dont know which mode i should choose. i try to understand the explanation of it . but i still got confused about it. i just want to know which mode i should choose , and what difference between them? by the way , Happy Thanksgiving!